Oregon Panoramas are divided into West of the Cascades and East of the Cascades. The weather and growing conditions, AND scenery are very different. 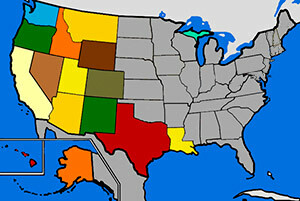 The USA Panoramas are from many states in the country...mostly west of the Mississippi. The colorful part of the map is where we travelled. The Grey area is still to be conquered. Digital Art Panoramas are members of the Digital Art Collections.These Pans are based on groups of like kind. Vertical Panoramas are very VERY long. They are twice as long as they are wide! They are well suited to the tall wall treatment. But if the wall needs width, not height, try Large Panorama Murals. They are several pieces side by side .